With this project I’ve gotten back on track with my audio-visual abstraction work. 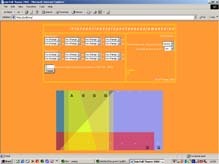 What ISJS is is a single web based musical instrument that controls an image on the web as well. The instrument can be played by many at the same time and it’s somewhat akin to 10 people, playing simultaneously, on the same guitar. The piece was inspired by an older project of mine that involved sending midi recordings back and forth between Scotland and the USA and building up musical collaborations. Some of the material was released on tape in 1995 under the name, “The intercontinental jam sessions”.